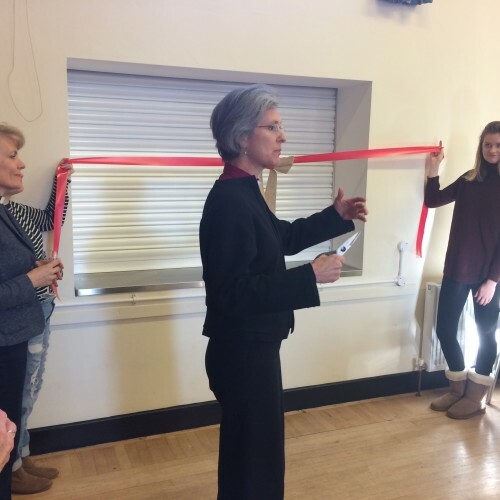 After more than 10 years of planning and fundraising, residents of Byfleet can at last use their new community hall at St Mary’s church, following the official opening by Bishop Jo in early December. Bishop Jo cut the ribbon on the hall’s brand new kitchen facilities, after the themed ‘Thankyou’ all-age service. Attendees were served Prosecco and canapés prepared onsite. St Mary’s rector, Revd John McCabe, said: “The day was fabulous – so many people came and from so many walks of life and connections with St Mary’s! It was really encouraging and very moving. The initiative to replace the old hall, built in 1965, began over 10 years ago, during which time the St Mary’s team steadfastly worked to source the funds required. £200,000 was raised to make the dream a reality through various grant schemes and a multitude of fundraising events such as tea dances, discos, running festivals, craft fairs and much more.